Arrive, check in and relax: Enjoy your stay in the rooms at Wyndham Garden Hennigsdorf Berlin Hotel with great interior and excellent hotel services. The 112 guest rooms of our hotel are attractively designed and the best choice for every occasion: for a city trip with the family or for business travelers. The city hotel Hennigsdorf in ideal Berlin outskirts position is the perfect base to explore the tourist highlights of Berlin. Guests sleep in a quiet surrounding and are in the vibrant and colorful capital in just a few minutes. Especially the free WIFI internet connection is worth mentioning for business travelers, so they can always stay in touch with their colleagues and business partners. 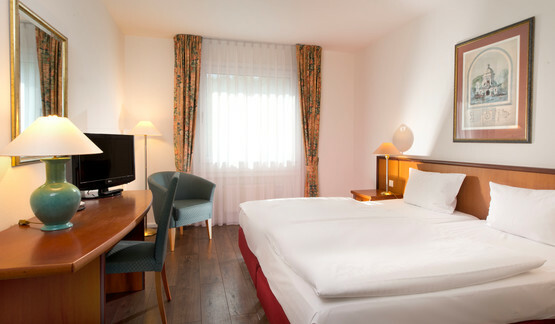 The comfortable standard rooms at the Wyndham Garden Hotel Hennigsdorf are ideally suited to your needs. Lovingly furnished and modern equipped rooms make your stay perfect on the outskirts of Berlin. Our guests find a restful sleep in the comfortable queen or twin beds. 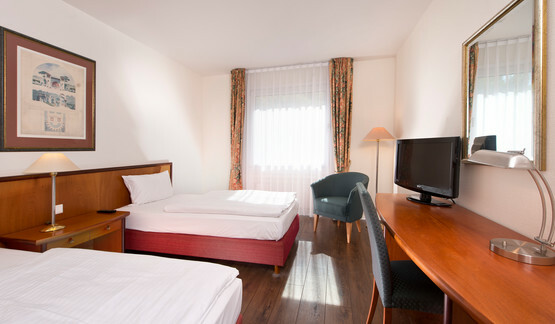 The hotel rooms of our Hennigsdorf hotel offer TV, telephone, minibar and a working desk with free WIFI internet connection. The bathrooms are equipped with bathtub and integrated shower, as well as a large mirror surface, magnifying mirror and hair dryer. 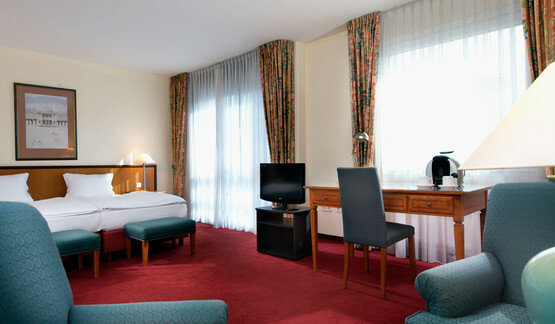 Especially popular is the Wyndham Garden Hennigsdorf hotel for business travelers. This is also reflected in the room amenities of the business hotel rooms: Their quiet location to the park guarantee you a restful sleep after a busy day, a large work area with free WIFI internet access allows you to work from the hotel room and daily there is a free water bottle, if it might take a bit longer. The bathrooms are furnished with bathtub and shower, a large mirror surface, magnifying mirror and hair dryer. 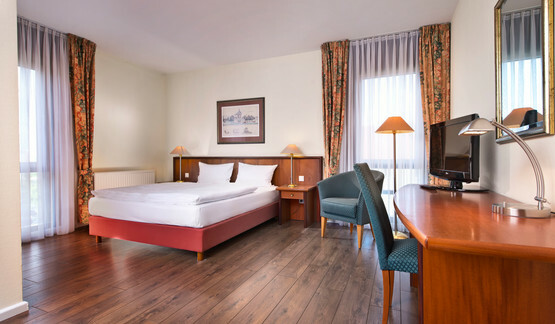 For guests who appreciate more space and many amenities value, the deluxe hotel rooms of the Wyndham Garden Hennigsdorf hotel are just right. In addition to TV and telephone as well as a work area with free WIFI internet access and minibar, we offer daily a free bottle of water at the room. The day starts in a relaxing way with a coffee, which you can prepare with the coffee machine at your room. In the bathroom with bath and shower there is a make-up mirror and a hair dryer. The deluxe guest rooms are already equipped with bathrobes, so nothing is prevented you to visit our sauna area. Our hotel near Berlin offers Studio suites with a size of 33 sqm, which are ideally suitable for families and long-term stays. The first-class facilities offer Flat Screen TV, telephone and minibar, as well as a separate seating area and an antique Art Deco working desk. In the comfortable bathroom guests will find a bathtub with shower, a large mirror surface, a magnifying mirror and a hair dryer. In addition they are equipped with an extended offer of cosmetic products, bathrobes and slippers. Thirsty guests can drink the daily free bottle of water or a delicious coffee, prepared with the Tassimo coffee making facilities.